Violinist, conductor, composer, arranger and music administrator Jaakko Kuusisto has been seeking to find more time for composing. His opera Jää [Ice], based on the novel by Ulla-Lena Lundberg, will be premiered at the Finnish National Opera and Ballet on 25 January. Jaakko Kuusisto is impatient. The first full runthrough rehearsals with full ensemble of his newest opera are about to begin. “This has been a great few weeks. At times like this, a composer realises in quite concrete terms what a huge crowd of people have been working hard to bring this work to life,” says the excited composer, who will also conduct the performances. The opera Jää [Ice], to be premiered on 25 January, is Jaakko Kuusisto’s greatest effort to date as a composer. He has been aiming for this achievement for some time: known for having a finger in numerous musical pies, Kuusisto has recently been clearing his calendar for composing and generally focusing on doing fewer things. 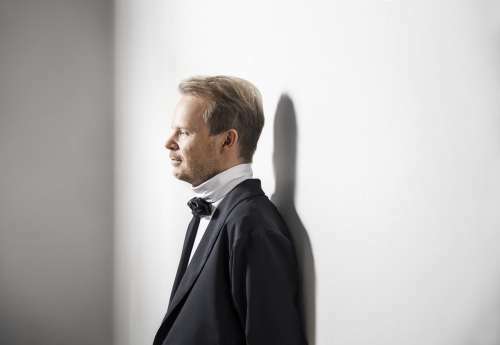 As a composer, he has been kept busy in recent years by a “long line” of concertos, most recently the Trumpet Concerto premiered just over a year ago and the Cello Concerto written for Arto Noras that is to be premiered at the Naantali Music Festival this summer. Kuusisto now says that no more concertos are currently forthcoming. However, there are agreements in place for a few major orchestral works. Kuusisto, who describes his composition process as intuitive, felt that focusing on concertos easily leads a composer to spin around in circles. A major new project like Jää was just the thing to open up new dimensions. Writing the opera proved to be a heavy process, though not because of the opera itself – quite the contrary, Kuusisto declares that he was remarkably inspired by the novel by Ulla-Lena Lundberg, a Finlandia Prize winner, and the compelling libretto adapted from it by Juhani Koivisto. It was more a question of fighting with time management, as Kuusisto was torn between multiple roles while writing the opera. Now his calendar is slowly clearing, as his appointment to the government grant working group of the Ministry of Education and Culture expired and his term as a member of the Central Arts Council will end in August. Kuusisto notes that he struggles to find time to play the violin. He does perform occasionally, particularly at festivals, and he is releasing a new disc this spring. “I would lose a large part of my musical personality without the violin. I feel it is important to keep hanging on to the instrument, so to speak,” he says. Kuusisto’s previous opera, Elämälle! [To life! ], which is about composer Oskar Merikanto, was his first full-length grand opera. Jää is another milestone, representing a transition from a gentle biopic to a narrative with profound themes and dramatic human fates. Lundberg’s novel is about the life of Petter Kummel, Vicar on a distant island, and his family in an isolated community hemmed in by the forces of nature. The dangers of the sea and the proximity of death are palpable. “It’s a very good story for an opera,” says Kuusisto, listing the operatic elements: natural forces, the hereafter, the inexorability of life. Whatever happens, life goes on. 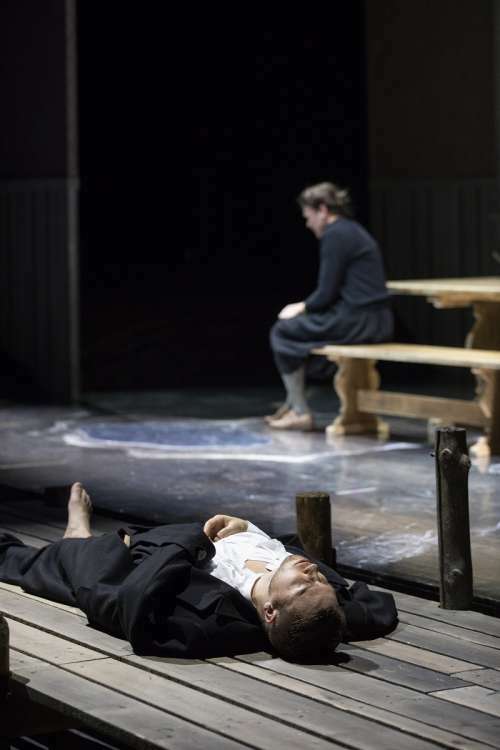 “The adaptation by Juhani Koivisto from novel to sung text was so touching that it began to generate a particular kind of musical landscape all on its own,” says Kuusisto. Soaring surfaces and pedal points in the strings evoke the sea. The “hard, unmoving surface” of a sustained E pitch is a sort of Leitmotif for the ice. Natural forces are also reflected in the cold sound of a synthesiser. 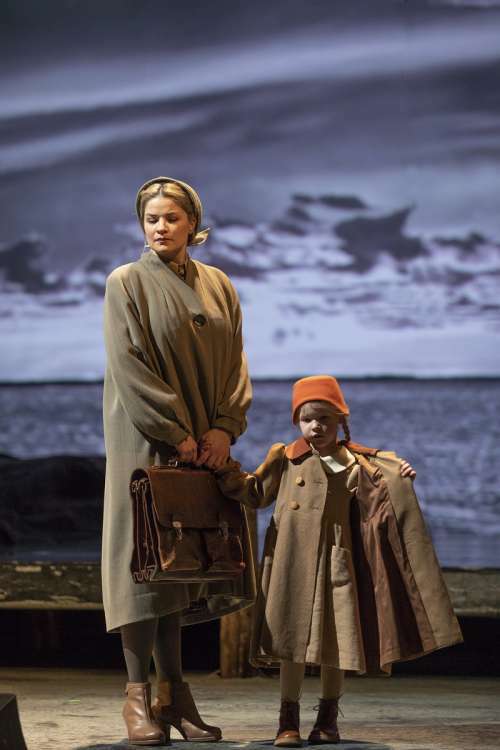 Left: Marjukka Tepponen and Sointu Vestman as Mona and Sanna Kummel. Right: Aarne Pelkonen and Mari Palo as Petter and Mona Kummel. The electronically processed sound of some instruments is associated with the sense of the hereafter that is a crucial element in the story. Anton, the post boatman, who has a speaking role in the opera, can sense the presence of dead islanders or ‘Guides’, who are here played by the chorus and assume a much more tangible and ghostlier guise than in the novel. The archipelago at night is evoked with a musical representation of the pitch-black sea where random rhythms of lighthouses and beacons punctuate the darkness. Certain textures, intervals and motifs tie the music of the opera together into a vast arc; even the overture presages tragedy. Kuusisto began the opera by writing the final aria of Mona, the Vicar’s wife, where a nervous and tense woman unleashes her feelings of extreme sorrow. Mona (soprano) has edgy and sharp music. Compared to her, Petter the Vicar (baritone) is a positive nature-child whose arias reflect the cadences of hymns. The third musically important character is Irina (mezzosoprano), a refugee from the Soviet Union who mourns the loss of her child. Her ‘mystically melancholy’ music erupts into an aria three times. At the end of the story, she finds out that her son is alive after all. Amidst death, a new hope springs. Yes, there are actual arias in this opera! Kuusisto felt that this weighty topic with grand, timeless themes called for building blocks from the traditional number opera format. Jää opens with an overture, every act begins with a choral introduction, and there is also a choreographed orchestral intermezzo. All elements of a grand opera production are geared towards depicting the inevitable tragedy, the glow of the hereafter and the mental landscape of the characters. On the other hand, the colourful cast of characters illustrates the life of an island community, from mundane tasks to celebrations. The production is directed by Anna Kelo, and the cast includes Marjukka Tepponen, Ville Rusanen, Jussi Merikanto and Jenny Carlstedt. What did this huge labour give to Kuusisto’s composer persona? “This project was about such big and dramatic things that I was obliged to take a serious look at my musical idiom. What things do I have in my toolkit? I have had to exceed myself, in a good way,” he says. Jää [Ice] at the Finnish National Opera and Ballet, 25 Jan to 9 Mar, and in the programme of the Musica nova Helsinki festival on 2, 5 and 7 Feb.Video of Jaakko Kuusisto speaking about Ice can be found here. See also: Musica nova Helsinki 1–10 Feb 2019: Don’t miss these.